Congratulations on making an excellent game. This is a standout entry to me. You should be proud. Polished, balanced, bug free. No apparent rough edges. 4/5, the highest score I am supposed to give. At first I thought the spiders were unfair and OP and couldn't get much past level 1. I put the game down and forgot about it. Then it came up in my judging queue and I spent another 30 minutes on it, and won! I now see that I was being a giant baby before. I'm happy with the balance in this game. In fact, it might be the best-balanced game in the whole event this year. Certainly not too easy! The scoring rubric says a 3/5 is "a neat twist on the usual mechanics," which I think fits this game. There's nothing head-exploding here, just a few well-chosen ideas. The scope is what I'd expect from a good 7DRL, so I gave you a 3/5 here. Four enemy types (larva, arachnid, beetoid, queen), six-ish abilities, small levels...it makes sense together, it's just not "OMG how is there this much content." A small, neat Roguelike with an A+ pun-tastic name and great gameplay with lots of nice touches that tie into its 'meters'-based theme well. Seems complete and polished. No bugs encountered (other than the enemies, who are literal bugs). Balance could do with improvement - the early game is much harder than the late game and some abilities (such as the Medkit) are vastly more essential than others. 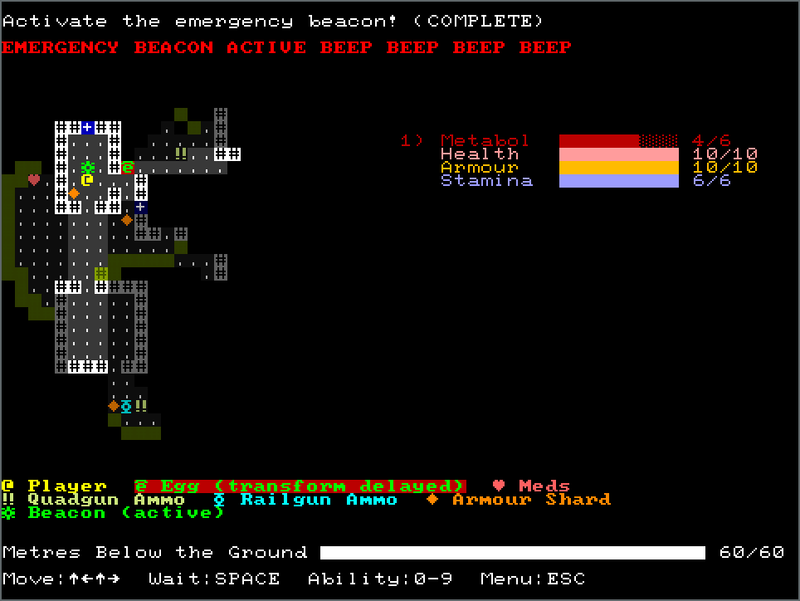 Nice clean ASCII, with some nice functional touches like enemies turning red when near death. Controls are simple and easy to grasp, though perhaps oversimplified for those used to traditional roguelike control schemes - you automatically go down stairs just by touching them and pick up items automatically, even when the relevant meter is already full, wasting the resource. A variety of small mechanics combine together well to provide some interesting tactical gameplay. In particular, the metamophosing enemies add some time pressure but with interesting means of managing it. The sub-objectives on each floor are also a nice addition that help to provide some variety. The deterministic combat means that you need to plan ahead and make clever use of your abilities to avoid the attrition of trading blows, but makes healing items paramount and (ironically) can make you highly succeptable to RNG in the early game, where you may simply not have the tools you need to survive. Despite this, I found it highly enjoyable. The game features a number of small twists on traditional mechanics which work together well and add up to an experience which is fairly unique. 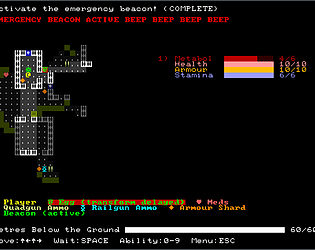 About what I would expect from a 7DRL; a reasonable number of abilities, enemies and objectives. Once you have seen all the different objective types there is not a huge amount of variety between levels, but to its credit the game limits itself to a mere 6 levels to avoid outstaying its welcome. I enjoyed this game a lot. It's clever, well thought-out, and feels very complete. The different special abilities feel nicely balanced (with the exception of the medkit, which seems more powerful than the rest), and I also liked how well progress meters were incorporated into everything. I also like the cleverness of the title and the variable ways of playing given the different missions and abilities. All of this suggests, to me, a score of 4 for completeness and fun. The game is short, though sufficiently difficult that it's possible to play several rounds of the game in a very short period of time (I think I got through about 12 games in 30 minutes, but I was pretty bad at it). This seems like a standard scope for a 7DRL, so a score of 3 seems appropriate. There is no question about this being a RogueLike though (score of 4), though I feel like most of the mechanics here are already present in other RogueLikes; the innovation this game brings is in how those mechanics are tied together quickly and neatly, and their connection to the progress bars. This seems more like an innovation score of 3. Potentially more could have been added (more content, more complex or unusual abilities / mechanics, etc. ), but given how polished and stable the game is I think what was developed here is still very good. Although ASCII graphics were used, it was very clear what the different objects were, how to move around, the character's status, and so on. In other words, the graphics were simple but pretty and clear (definitely a score of 4). Overall, this was one of my favorite (if not my most favorite) entry for this game jam. Excellent work! I have played about ~50~ games so far in this jam and this is probably my favorite. It's tough and tightly designed. Each item has it's own use and every time you have to choose a new one you have to choose carefully what item pairs well with what you already have. Not the most complex game but easily one of the best I've played so far.